Nepal, as a land-locked country bordered by China in the North and surrounded by India in the East, South and West, heavily relies on foreign aid and tourism. As one of the poorest countries in the world, it is rich in bio-diversity due to its unique geographical landscape with greatest mountain range, thick tropical jungles and fostered hills. The country has 123 ethnic groups and sub-groups who speak around 70 languages and dialects. Located around 30 km to the east of Kathmandu valley, Dhulikhel is a major tourist destination with attractions that range from the natural landscape to cultural and historical elements. The total area of Dhulikhel is around 55 sq.km with a population around 34 thousand. Dhulikhel has 75.26% literacy rate with the total school enrolment rate of 99%. 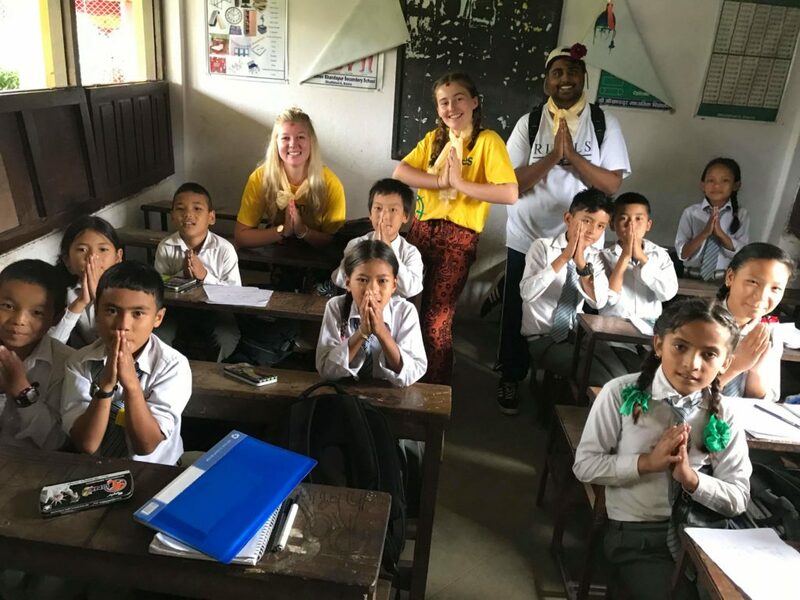 Although Dhulikhel appears to have progressed in its education and health services, the dropout and irregular class attendance rate along with the lack of health and sanitation awareness are still major challenges to address. Our efforts are mainly focused on supporting disadvantaged children in Dhulikhel and its surrounding areas. Nepal is currently struggling to bounce back after the earthquake in 2015 which killed nearly 9,000 people and injured close to 22,000 people. Many families were displaced and relocated, leaving children with a limited access to schools. As a result, the dropout rate and irregular attendance of children in schools significantly increased. In Nepal, the access to quality education, sanitation and personal hygiene issues, gender inequality and environmental pollution are major challenges when it comes to achieving Sustainable Development Goals set out by the United Nations. Whilst the enrolment of children in primary schools in Nepal has significantly increased at 97%, over 5% of children are still out of school. Poverty, child labour, lack of resources, teachers’ absence, gender inequality, the geographical landscape and natural disasters are some of the challenges to quality education in Nepal. Health experts state that 50% of Nepal’s communicable diseases could be prevented if people were provided access to safe drinking water and made aware of personal hygiene and good sanitation practices. Despite the government stating to have made significant progress in the field of public health, 30% of the people in Nepal still have no access to toilets and almost 25% of the people have no access to safe drinking water. The other major challenge relating to sanitation in Nepal is the absence of sustainable and effective waste management. The waste problem has created health and environmental hazards in urban areas. The main reasons behind the air, noise and water pollution are rough road construction, slum developments, degradation of natural resources and traditional habits of Nepalese people. Additionally, a significant amount of solid waste and plastics are left to decompose in open spaces. Nepal faces a number of challenges, predominantly in remote areas, in the areas of Health, Education, Livelihoods, and Waste Management/Sustainability. The FutureSense Foundation Nepal Hub, works closely with partners in addressing long-term development issues in order to provide access to life-skills development, quality education and public health. A main priority is not only to build confidence and resilience by inspiring children to overcome the earthquake trauma but also to improve schools’ infrastructure through small projects. We are currently focusing on four of the Sustainable Development Goals (Good Health and Wellbeing, Quality Education, Gender Equality and Clean Water and Sanitation) set out by the United Nations. Understanding a basic conversation in English is one of the major challenges of our local children in schools. We conduct English lessons with children in our partner schools to increase their confidence of basic communication in English, focusing on essay writing, self-esteem, vocabulary, pronunciation, geography and listening and reading skills. Our students have the opportunity to engage with native speakers of English language (volunteers) in interactive and exciting lessons. Most schools in Nepal are strict on their curriculum and utilise traditional rote learning methods. Our life skill activities, bring new types of learning and positive behaviour in students. Activities help to develop essential skills like creativity, critical thinking and problem solving in students. Sessions surrounding ‘Healthy Habits’ (Nutrition, Personal Hygiene, Sanitation) provide students the opportunity to engage in team work, build leadership qualities and grow in confidence. We improve schools’ infrastructure through painting murals which help to foster creativity, promote an optimistic attitude and nurture emotional growth among our students. Our volunteers have painted 3 rooms, 1 compound wall, 1 courtyard, 1 office wall, 15 windows and 2 indoor walls in 5 different schools. One of the major issues of Nepal is managing waste. Plastic is a threat to our health and it is visible amongst most roadsides and in both rural and urban areas. As there are no recycling systems in Nepal, it is commonplace to see people burning plastics as a waste management practice. Through our Sustainability programs we focus on conducting workshops around the environment and sustainable practices with our partners. We have recently conducted 8 workshops among 450 students on the topics of waste management and recycling, climate change and why it’s important to care for the environment. We have been able to build two new waste bins from painted bricks and create 12 pots to house plants out of used plastic bottles. "Nepal is a beautiful country with the range of Himalayas, high hills and flat green fertile land. It is a multilingual, multicultural and multi-ethnic country. Although Nepal is rich in its cultural diversities and natural resources, it remains one of the poorest countries in the world. Natural disasters, unemployment, poverty, lack of quality education and health awareness, gender inequality and environmental pollution are some of the major challenges which Nepal has been coping with. We can address these challenges by building the capacity of each individual to understand their roles, potentials and values. We have to empower marginalised and disadvantaged communities through education and awareness programs by accepting their cultures, religions and social dignities. I believe that the role of volunteers ensures the ongoing delivery of a range of important services, helps to build social networks and community resilience, impacting positive outcomes in our communities".